We missed last week’s White House state dinner for South Korean President Lee Myung-bak and Mrs. Kim Yoon-ok. But the “celebration of a fall harvest” theme and the fact that Korean and American pears were part of the dessert menu is worth a Pear Twist quick recap. 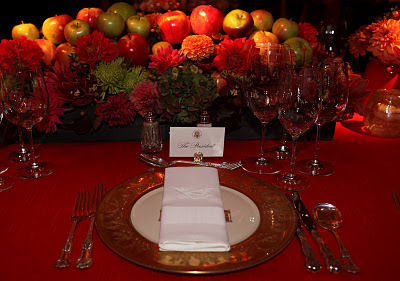 Autumn harvest colors—red and orange—and fall foods set the tone for the October 13 East Room dinner. There was a rectangular head table for twenty and round tables of ten each with its own color scheme and floral centerpieces filled with “hundreds of apples.” Shadows of fall leaves and apples projected on the walls and ceiling enhancing the fall harvest feel. During the post-dinner reception in the State Dining Room, guests were entertained by the hot sounds of Janell Monae and the classical sounds of the Ahn Trio. Here’s the yummy 4-course menu, which included foods from the White House garden. First course: Butternut squash bisque, honey poached cranberries, Virginia cured ham, pumpkin seed praline, crème fraiche. Second course: Early fall harvest salad on daikon sheets, masago rice pearl crispies, rice wine vinaigrette. Main course: Texas Wagyu beef, orange-ginger fondue, sauteed kale, roasted kabocha squash. Dessert: Chocolate malt devil’s food layers with pear and almond brittle.